It’s been a trying time in our beautiful state. California Gov. Jerry Brown (D) in a Sunday press conference called the wildfires ravaging the state “the new abnormal,” warning environmental disasters will only “intensify” over the next two decades. “Unfortunately, the best science is telling us that dryness, warmth, drought, all those things, they’re going to intensify,” he added. 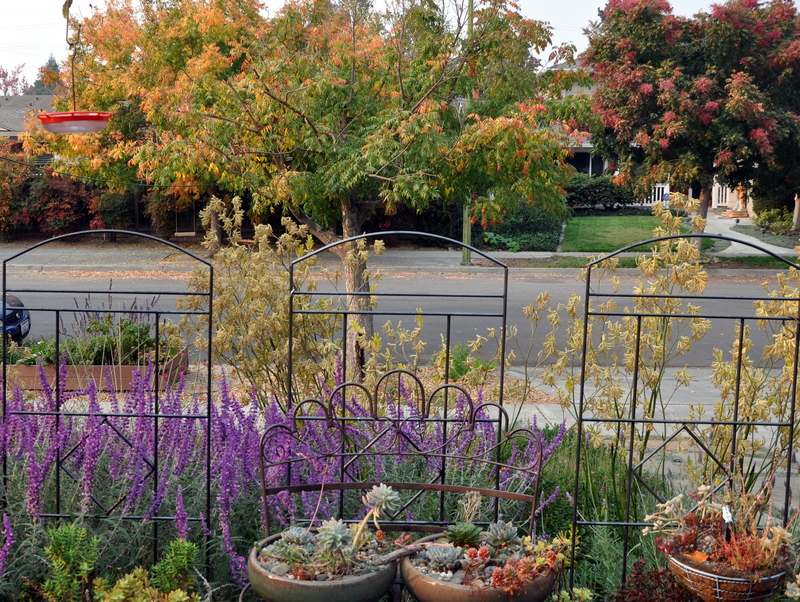 I’ve been thinking back to my small efforts to bring my garden into alignment with the realities of living in our semi-arid state. They seem trivial now as we wait for rain, watching helplessly as forests burn, destroying homes and lives. My friend Laura moved to Paradise, California in June, looking forward to starting a slower-paced life away from Silicon Valley. She’s been fixing up their new home, installing a fence to contain their dog and choosing paint colors for the walls. Their contractor just finished a stairway to the deck. Last Thursday, Laura’s family and others fled the small town of Paradise as one of the fastest moving and most destructive fires in California history tore through her town. Harrowing tales of fleeing down the highway with walls of flames on both sides are the norm. As of this writing, 138,000 acres burned, over 10,000 structures including homes have been destroyed and the death toll today climbed to 56. 52,000 people have been evacuated. On Sunday, Laura learned that her home was one of the 5% that survived, but it’s small comfort. The fire is expecting to burn for another two weeks, and when it’s finally out, the infrastructure is gone. Without phone lines, cell towers or electricity, there isn’t much to go back to. She’s staying here in the Valley with her folks, desperate to return home and hoping her cat is okay. Meanwhile, a second massive fire burns in Southern California. Our beautiful planet must surely weep with the agony of her destruction. I appreciate all my friends out of the area that have reached out in concern. We live in Silicon Valley, and though close to forested areas, we’re a safe distance from the flames. Smoke from the fires hangs over the Bay Area, creating unhealthy air quality for a week. Schools are keeping children indoors and local marathons and foot races cancelled till further notice. There is a sense of collective grief, with everyone knowing someone that’s been affected by these fires. We all want to help. For now, we wait and hope. This entry was posted in California Drought and tagged California Wildfires, Camp Fire, climate change, grief, Woolsey Fire. Bookmark the permalink. Beautifully said, Kate. We’re seeing the extremes everywhere, fighting an uphill battle, at least in the US, with climate change deniers starting at the highest office. In the early days he had the nerve to blame California and threaten to withhold federal funding. If you can’t admit to the problem, how can you begin to solve it. I hope for future generations it’s not too late. Our Mother is indeed tormented and angry. On a lighter note, I’m glad you liked the photos. It makes me glad I didn’t have children who’ll have to deal with the aftermath. But I have hopes for the next generation, many of whom seem to give much more of a damn about their heritage than those who helped to create the problem. I have hope for our generation of young people too, Kate. Each generation learns from the last. Once you’re aware, there is now turning back. I think education is key. Some days I have trouble believing we’ll get it fixed, when I hear idiots on TV pretending there’s nothing wrong… I’m crossing my fingers tightly that your faith in the next generation is fully justified. oh hon, my heart is broken for Laura. As you wrote, while her home has survived the flames, there’s no way to live amid the devastation. I can’t even imagine an entire city burning down and so many lives affected. I can’t help be worried for the future effects of global warming. How will our forests, rivers and lakes survive. We may be gone but as a mother, I know you must loose sleep over it. Honestly, I almost dread summer after our last one. I know what it’s like to breath smokey air, day after day. It was so smokey, it blocked the sun for almost the entire month of August. If only it would rain !! Oh no!! How much could you bare? I would be totally broken. Was Crookshanks an outdoor kitty? I have Petals and Blossum’s carriers in the closet at the door. But in an emergency, I can only hope they’ll come to me rather than hide. I’m happy to hear it’s raining! Finally. I have been thinking about you this week as I look at the pictures of burnt homes and cars. I’m glad to know that you are safe, but my heart goes out to Laura and all those affected. I wish I could send you some of our rain – the ground is saturated here at the moment and we really don’t need any more! I could weep when I think of the rampant consumerism and corporate irresponsibility that I see all around. I’m sincerely glad that I don’t have children who will have to suffer the ongoing consequences of all this. But, for now, I continue to reduce what I use, grow food, make do and mend and try to spread the word. Stay safe and tell all those affected that there are lots of us out in the world thinking of them and wishing there was something we could do. Hi Jan, I’ve been absent from blogging for awhile, but I wanted to acknowledge your comment. We have similar problems here, more sniping, less getting it done. In the end, the Camp fire took over eighty lives. One friend ‘s home burned to the ground, another had damage up to the fence and tree line. She’s displaced and will be for some time, currently renting week to week via Air B&B’s. I hope the wake up call comes through loud and clear. Now they’re trying to find a “home” for all the toxic debris cleanup. No one wants it (no surprise). It’s hard to know what they’ll do. I hope things are well at home. Happy New Year. Thinking of you all – such terrible destruction. Yet Donald Trump proclaims to the world there is no global warming and refuses to do anything. Somehow I think nature will have the upperhand in this and show him that Global Warming is happening right now. Thank you, V. It’s been a trying time for everyone in the state, and the lack of leadership at the top is salt in the wound. We’ve finally had some cleansing rains after 13 days of unhealthy air throughout the state. I can only imagine what it’s been like for people close to the flames. Thanks for your kind words. Hello Cathy. We do live in a strange world, where priorities are horribly skewed. It seems were always willing to pay for weapons, while everything else takes a back seat. I’ll never understand it. We’ve finally had some rain with another storm on the way. The Paradise fire is 95% contained, but is expected to burn through month’s end. The Malibu fire has been less destructive with loss of life and property and is now 100% contained. 84 lost there lives, Cathy, with many more still missing. It’s devastating. The news reports look horrifying. With all the hurricanes, floods and fires around the world recently I don’t think we need disaster movies any more – it’s become the reality for many people. Keep safe and I hope your friend eventually manages to make her dream of a quieter life come true. Thank you, Lynn. Laura’s moved into a hotel for now as they look for a place to rent. No luck finding her cat, but they remain hopeful. I too hope she can make that dream come true. So many shattered lives. It’s been hard to take it all in. The devastation is almost beyond imagination, and definitely heartbreaking. I am glad your friend Laura is safe. As for your garden, no effort to better our environment, or our world, is too small or too trivial. I’ve been thinking of you and your own challenges dealing with the loss after the major earthquakes. The fear never fully goes away, does it? Thank you for your kind words, Amanda. I hope you are doing well. This is too awful, too relentless, too heart breaking. I know it’s a human tragedy but I get really hung up thinking about the animals that are terrified, too, and dying–I know you’re probably very moved by that, too. I’m glad you and your home are safe, even though this must be psychologically devastating for every Californian . . .
Kerry, it’s been so hard seeing and hearing the stories of lost animals, mostly cats as the dogs were easier to evacuate. Facebook is filled with “landmines” of photos that are just too hard to bear. It is psychologically devastating. We’re all feeling the losses and the helplessness that comes with this level of tragedy. We brace ourselves daily for the update. The better news is that the fire, thanks to the rain is now 95% contained. Sadly the death toll continues to climb. I feel grateful for all that I have: a warm home, a roof over my head, and the love of my family. It snaps everything into perspective. We too know someone who lives in Paradise but luckily they were away at the time. I don’t know what they will come home to. Whether their home survived or not, the important thing is that they’re safe. That’s all that really matters. Sara, I’m glad to hear your friends are safe, but I’m sorry for their loss. Wishing them all the best. My husband and I have seen those fires on the evening news, and even though we are across the country we feel the horror. Our hearts are with those who are in the fire’s path. So glad you are out of harm’s way. Wish we could send California some of the rainy weather we’ve been having. Yes, to working with what your climate will support! 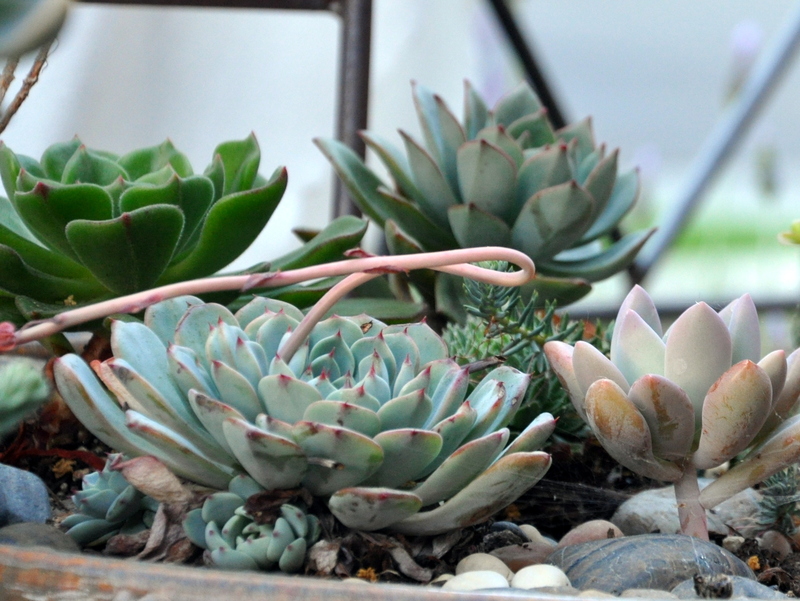 And, I must say, I love succulents. Hi Laurie. Thank you for your good wishes. We’ve finally had some rain this week, with a bit more in the near forecast. The fires are now 95% contained, but the death toll continues to climb as they search the ruins. It’s devastating. So glad you are finally getting some rain. What a terrible time for your state, for this country. Our hearts go out to all of you. Alys how very worrisome. We have following the fires on the news. We need to find a better way. Each little effort is important. 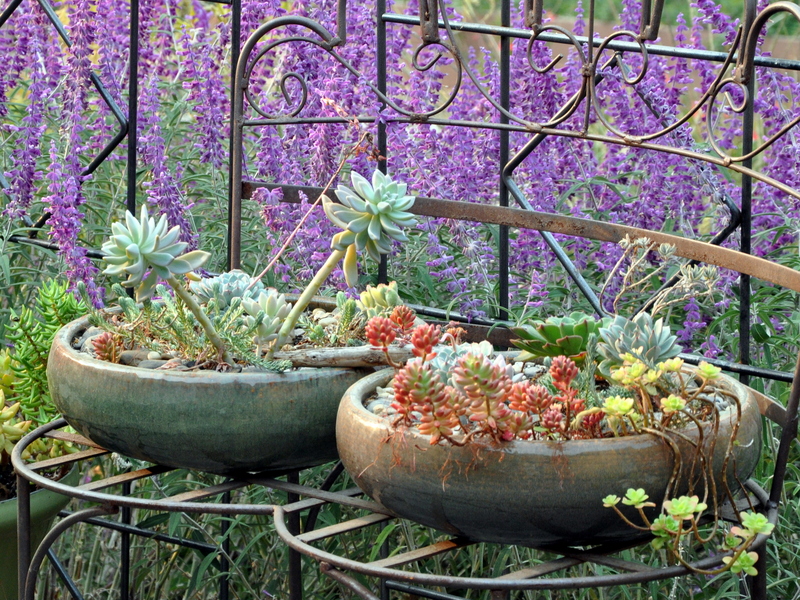 Your drought friendly garden is an example of that. Take care. We’re watching from afar, on one hand thankful we are no longer living in that area, on the other hand frustrated and wishing we could help more directly. Many of my friends and neighbors from Oroville are housing evacuees, or helping out in other ways. We’ve donated money but it feels so strange to be so far away now. Several art connection friends have lost homes in Paradise. Just so heartbreaking. I’m sorry to hear so many of your friends have lost homes, Barbara. It must be strange living so far away as this happened after living “around the corner” for so many years. I’m happy to hear that Oroville residents are offering housing. The outpouring has been wonderful. Sending money helps, but like you, a donation feels a bit hollow when the need is so great. It’s not though, and we need to do what we can without punishing ourselves for not doing more. If everyone steps forward, not the least of which is the federal government, the broader problem can be solved. For now we wait for the fires to extinguish. We’re in the midst of rolling storms, so for that I’m grateful. We had drought and some wildfires here in East Texas in 2011, but we are on very flat land with lots of roads and ways to evacuate. I cannot even imagine what it would be like to be in such a hilly area with only one way out, when a fire starts. And we have floods all the time, but something of your house is left after a flood, making it easier to start over, and the infrastructure is all in place too. So the devastation left after these fires is something I can not even grasp. I feel so sorry for those who lost everything. I know you will be agonising over this terrible situation and my heart is full for you. I am so pleased to hear Laura and her family are safe. A home left standing in a place of devastation and loss is probably not a lot of compensation. And a lost cat tends to focus our thoughts on loss……. I wonder how many escape and are found again. I have noticed with O that he knows when earthquakes are coming and leaves the building. Are they the same in a fire? Pauline, thank you for your kind words and understanding and your always-focused energy toward the good. I hope it’s not too late for our planet. I wish the rest of the world would take a page from New Zealand where you’ve put a lot of energy into keeping your country beautiful, reversing trends (like the special island for the near-extinct birds). I believe it’s Galivanta who started blogging after the devastating Christchurch earthquakes. It makes sense that PTSD would be present and difficult to overcome. I’m sorry to hear they’re not receiving proper help. A number of the women at Lifted Spirits also experience PTSD. It rears itself in many ways, and I think is often misunderstood. Sadly, Crookshanks has not been found. He wasn’t microchipped, but had a collar and a distance crook to his tale. The shelters, UC Davis veterinary school and many non-profits have stepped in to treat injured cats, rescued horses, even a couple of cute pigs. People were able to escape with dogs who come when called, but as you know, cats do things on their own terms. The photos of cats with burned whiskers and bandaged paws is so hard to take. You’re the wise woman staying away from social media. In the midst of my grief over all the destruction from wildfires and floods and hurricanes, etc. my mind boggles at the willful ignorance of the current “leaders” of this nation. The people of California, as well as the rest of the country, are in my prayers daily. I’m so sorry Alys, I’ve been thinking of you and all the devastation in your state. How awful! And our baby in chief just keeps sending out insults. California is such a beautiful state, I hate how the fires and floods have destroyed so much this year. Sending good vibes your way and hoping your area stays safe. Thank you, Karen. “Baby in Chief” sounds about right. I could barely stand it when they said he would come to our state and of course it was as embarrassing and insulting as I expected. Pretty much what we’ve come to expect and have to endure, but nothing we’re terribly happy about. Thank goodness for the Blue Wave, Mueller and all the rest of us fighting the good fight. I hope you had a nice Thanksgiving. Oh, Alys … this is all so heartbreaking! Though it’s an enormous relief to hear that Laura’s home was spared, you’re right that there’s little to return to without any modern infrastructure. And the 95% others whose homes weren’t spared — it’s a nightmare beyond comprehension. We can only hope that devastating events like these will create greater awareness of the very real dangers of climate change, and that public pressure will build for governments at all levels to provide both leadership and action. In the meantime, it’s up to each of us to try to minimize our footprint as much as possible and to adapt, as you are doing in your garden. A big hug to you from the north, and please stay safe! A big hug back your way, Heidebee. The shock is wearing off for many of the survivors as they wonder what next. For many, it means a lost home, a lost job or business and lost animals. We’re already suffering from a housing shortage, so housing these folks, even temporarily is monumental. I need to stay focused on what *I* can do or it all becomes overwhelming. Thank you for being here. Sending love your way. Alys, this is terrible. Thank you for taking the time to write and tell us about it though. To those of us who feel far away from California you have give this disaster a name. Thinking of you and Laura. Thank you, Anne. 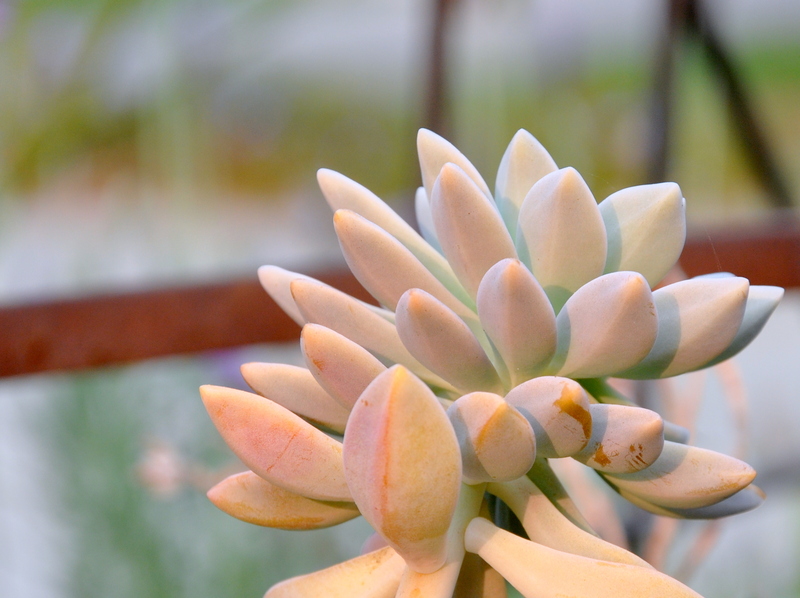 Funny that I should post these photos before seeing your succulent drawings on instagram. They’re remarkable plants, aren’t they? We’ve had a cleansing rain this week, long over-due and so badly needed. It will hamper some of the efforts to identify the remains, but hopefully it will aid the firefighters in other ways. Our air has been in the unhealthy range for 13 days straight. We’re all house-bound, trying to avoid the thick, dirty air. This was the first real rain in over 200 days! Thank you for your kind words, and for the way you beautify the world with your botanical art. It’s a gift to us all. I know lots of people already asking for things and starting GoFundMe sites. I have a friend who wants Christmas ornaments to keep it going for her and her kids. I love you Alys for posting this. I’d like to add Paradise is and early retirement community and the working poor. These people left places like the Silicon Valley to live an easier more peaceful lifestyle- or like me went to reinvent themselves. If you plan on making a donation please do so directly to these communities not any old give button where money heads to WDC and a percentage returned to the Campfire victims. Pay for the fires. Brown wants to pass the cost on to you the consumer. That BS after all the damage PGE has down to this state in the past 10 years we need to hold Them responsible. Bill 601 started 1/1/2019 not hold the utilities responsible for their damage! Only in 2018 can we put their feet to the fire. Guess what? We are all signing that thing! Please write Diane Feinstein who barely won by a narrow margins and let her know that these fat cats at PGE are responsible for distorting California. Up for a real task? Write the guy in the White House, Maybe his comment about poor financial management made you bristle. But truth be told Trump cut funds to our national forest in paradise which needed the maintenance money to keep this from happening. Lastly, you know someone who lost everything or nothing at all. Send them a hand written note and just let them know they are in your thoughts. The news has been heartbreaking. I cannot imagine the hell these wild fires bring. I am glad your friend made it out okay. It will be a long time before she can return, but at least she is alive and won’t have to rebuild her house. Small blessings. Eliza, so true. It’s slowly sinking in for the people who’ve lost everything, and even more devastating for those who lost family members who were unable to escape. It’s particularly hard to see all the lost animal posters and the injured animals rescued and in bandages. Laura is grateful to have a home, but after a year where her sister died, and her stepson was found dead of an overdose and now this, I don’t know how she is getting out of bed each day. I’ve been watching the fires and hearing the stories of devastation. It’s awful, and as Mr. Brown says, the new abnormal. It’s terrifying. I do think, though, that if everyone made small changes, it would help. 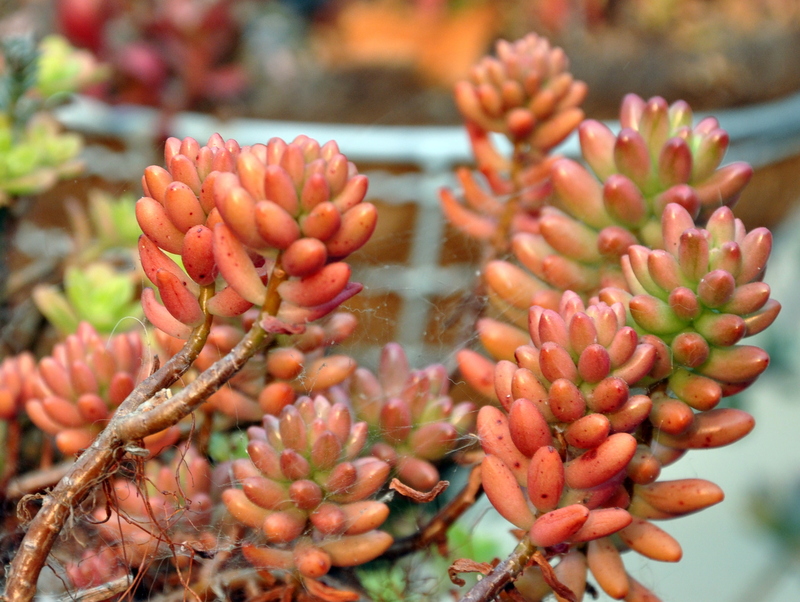 And your succulents are so beautiful. We have to balance the beauty we can create against the hardness of reality. Keep making beauty, Alys! Thank you, Lisa. Such kind words. I’m not defeated, but I am weary and sad and overwhelmed by it all. We’ve had a cleansing rain after 13 days of toxic air, but the fires still burn. It’s a monster. I hope this is our final lesson on what not to do to our beautiful earth. You did everything you could with xeriscaping but I know you will do whatever possible to help. It starts at the top and no one is listening. I’m devastated like everyone is at the sight of this burn. I remember driving through our burned areas in AZ for years after the big fire before seeing even a glimmer of regrowth. The reservations began a major campaign to clear deadwood and undergrowth but every October just when the skies were clear and bright, they would back burn so no one could breath. We need real solutions in every area. They are still clear cutting here with nothing to hold the hillsides and then they will build more homes to slide down them in the rains. Has everyone lost their minds? Paradise was not an affluent neighborhood so it was left vulnerable. I’m angry and so sad all the way to my core. The insanity is everywhere and I know their faces. Like you, I’m beside myself with grief for those families and the animals that were in those areas. So many did not survive and it’s heartbreaking. How loud does Mother Nature have to get to be heard? I just don’t know what to do. I’ll do what I can. It does start at the top, and fortunately California is not going to roll over on climate change. Jerry Brown is a strong environmentalist as is Gavin Newsom so I feel we’re in good hands BUT without cooperation from our current, obstinate federal government, the work will all be uphill. I’m stunned to read that Oregon is allowing clear-cutting. That makes me so sad. When are we going to learn? The loss is difficult to bear. They have done a LOT of clear cutting in Washington and in Oregon. We also lost our wonderful Fabric Depot. Poor management by the children that inherited it. ;( It’s a crazy world and will probably get crazier but I’m holding out hope. How disappointing on both fronts, MH. Sigh. Last week, I recorded students discussing Brexit for the research I’m doing. One of them hadn’t been old enough to vote and she expressed her anger at how generations before her had decided her fate without necessarily facing up to reality. Thus, we have a similar situation with climate change, only on a far grander scale. Of course, the average person can do their best but when world leaders are denying the very existence of the problem, it is difficult to make the headway we could to keep temperatures down etc. I am glad, anyway, that your home is out of the line of fire and Laura’s has survived. Poor woman – her dreams so badly marred! Helen, I didn’t know you were doing Brexit research. I hope you’ll share in more detail. Your student is right of course, though this is true of everything in life. We start out small and helpless, then reach adulthood and have to deal with the situation at hand. Our local radio station did a week of coverage last week on Brexit and the complexities that lie ahead. So many things we’re not thought out and the consequences are now at the door. Many of us certainly feel that here. Laura is devastated by this loss. Her close friend moved to Paradise as well and saw her home burn to the ground. She escaped with flames on both sides of the road with her four children and three dogs. It’s heard to fathom that fear and loss. As for my research, it is in linguistics rather than politics, so I’m looking at features of speech. My academic mentor suggested Brexit because I needed something that would be interesting enough to bring in participants and get them talking 😊. Wishing you continued safety, and improving air quality. It’s all so horrible and frightening and sad. 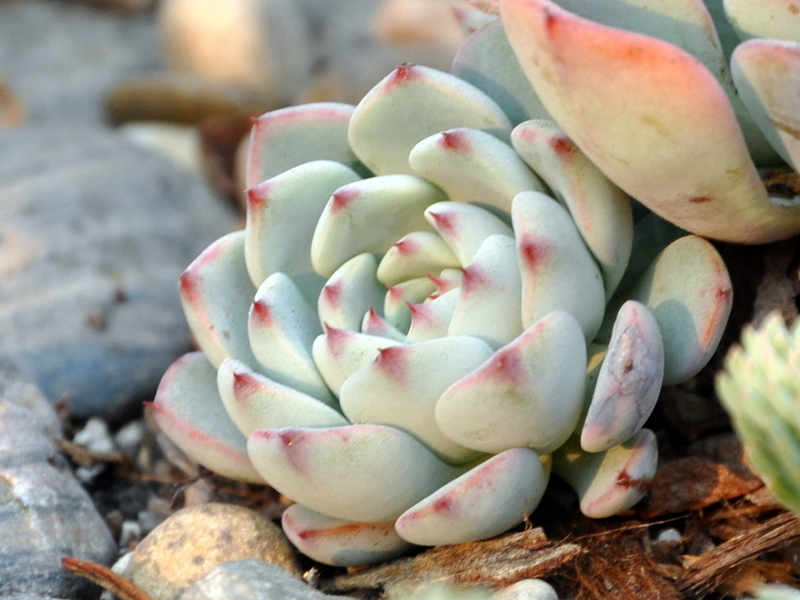 On a happier note, your photos of your succulents are STUNNING. Thank you for sharing such beauty. Thanks for your kind words, Phil. We’ve had a cleansing rain at last, and though it creates additional challenges for the search teams in Paradise, it has cleaned the air, dampened the ground and aided the control of the fire. Our air has been toxic for 13 days, so we’ve all felt house-bound, and at the same time constantly aware of the suffering in the northern part of our state. You’ve penned it well, Alys, and the “collective grief,” so well said, is heavy! I have a friend in Paradise who lost her home, and her daughter and husband lost theirs as well. For those who have their homes, it must be equally distressing in an entirely different way, since there’s nothing left of the town itself. All services, all life as they knew it, gone. This is truly painful. I think you’ve helped me, though. I’ve had such a “heavy” week and felt sick, physically and emotionally, and couldn’t put my finger on it. It is indeed the heaviness of grief. It’s tangible…along with chewable air. Blessings to you, and we all hope for the survivors of this. There will be much work to do, and I’m hoping we can find ways to be of help. Thank you, Debra. My heart goes out to your friend and her family. A double loss for them. It’s hard grasping the scope, the sheer magnitude and horrible devastation of this fire. “…the heaviness of grief along with chewable air.” Beautifully said. I’m witnessing many creative ways for people to help, and I have confidence in the people of California and our incoming governor to do the same. Thank you for leaving such a thoughtful comment. Oh, Alys, I’m so sad at the losses people in Paradise and elsewhere have suffered. My best wishes to your friend Laura and her neighbours. What a terrible time. Alys, more than a foot of snow has gifted me a day off of work, and I decided to use part of it to visit friends on WP. Of course, we have communicated on other venues, but I’ve not visited here in months. The fires have been devastating, and of course, Individual 1 added insult to devastating injury. Your story about Laura added a personal touch. I hope she is doing okay. Your images are really great, and I’m always grateful for people like you who are working so hard to be kind to the earth and conserve available resources.